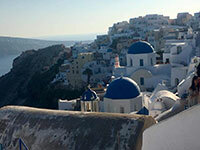 Cruising & Biking the Greek Islands! 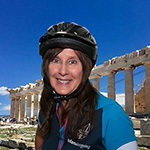 We will fly from Tampa to Athens Greece where we will stay 1 night before departing for the Cruise & Bike adventure. 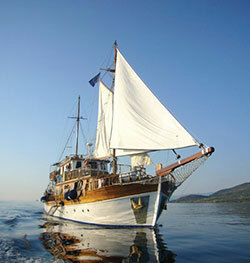 We will sail through the Cyclades & Saronic Islands for 7 nights aboard the Panagiota. The Cyclades, which comprise more than 30 islands, were the cradle of the first European civilized society 5,000 years ago. It is also here that Greece shows its most unadulterated side in all its variety: Gleaming white cubic houses with blue shutters and labyrinth lanes give the typical architectonic flavor to the island towns. 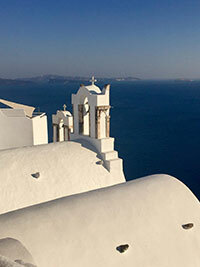 The mostly rugged coastlines show impressive geological formations, turquoise-blue sea and fantastic sand beaches. Experience the fascinating mixture between antiquity and modern times on your motorized sailing ship or the bicycle and absorb the authentic beauty of the Greek Aegean. 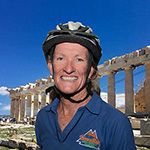 After a week of biking we will explore Athens for 2 more days before heading home! Physical requirements (Grade 2-3) – this is a difficult cycling level so this trip is recommended only for experienced and fit cyclists. The daily bike routes have a length of 10 to 22 miles and lead through hilly or mountainous areas. Some uphill stretches are included. The roads are mostly asphalted. Helmet use is mandatory on all bike tours. You are free to set aside a half or full day to swim or spend on board the boat, instead of taking a planned cycle tour. 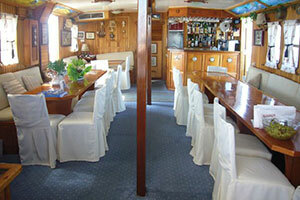 Individual journey to Marina Zeas, the yacht harbour of Piraeus, only 25 km from Athens airport. Check-in from 2 p.m. on the ship. Dinner on board. Overnight stay in Piraeus. Early in the morning the boat takes you to Kythnos Island, which was famous for their cheese and honey since ancient times. The first cycling tour, which starts in the harbor of Merichas and first leads us to the capital Chora, offers lots of scenic views to the coastline. Chora is an appealing village, situated on a high plateau. Its angular alleys are decorated with painted flowers and geometric patterns. From there today’s cycle tour leads us to Driopida, a picturesque village. Afterwards we return to Merichas, where we can spend the evening in one of the cozy taverns. In the morning the Panagiota takes us to Seriphos, a small island far from the tourist track, with deep valleys, countless bays and coves and lots of beautiful sandy beaches. From the harbor town of Livadi we cycle along a serpentine road to the main town of Seriphos, whose cube form houses nestle along a mountain ridge high above the sea. We continue on through untouched landscape to the Byzantine monastery of the Archangel Michael. We return to Livadi along a panoramic road on the East coast. 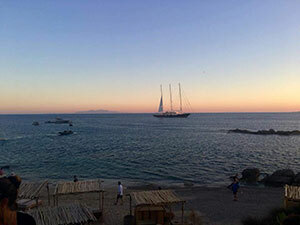 In the afternoon the ship brings us to Siphnos, where we can relax at the beautiful beach. Overnight stay in Kamares on the island of Siphnos. The island of Siphnos, which is famous for its ceramic artwork, is only inhabited away from the coast, because its coast drops mainly steeply into the sea. The cycling tour begins in the harbor of Kamares. The route leads through a green, hilly terraced landscape to the central highlands with the island’s capital Kastro, which is a defensive settlement built on a steep cliff face and has been a listed and protected town since 1975. In the afternoon the ship takes us to Syros, where we can round off the day in one of the numerous cafes on the spacious harbor promenade. The town of Ermoupolis on Syros is the capital town of the Cyclades and offers an unforgettable view upon arrival: The town, which is built on two hills, is different from the other Cycladic towns. Pastel colored houses, many of which have classical facades dominant the townscape. We cycle along the coast of Syros, which is full of bays and coves along the entire southern half of the island to the beautiful beach of Galissas and then past the convent of Saint Barbara back to Ermoupolis. 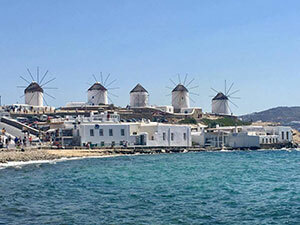 In the afternoon we continue by boat to Mykonos, where the picturesque main town with its famous windmills and its white cube form houses invites visitors to stroll through it. With a bit of luck we may even see the mascot of Mykonos in the maze of laneways, the pelican Petros. 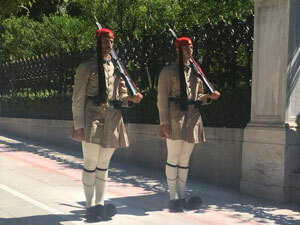 In the morning we crossover to Tinos. There we first visit the famous Evangelistria church in Tinos town. Today’s bike tour takes us along a high road to the mountain village of Tarambados, a village full of walled dove towers with their filigree architecture, which represent remnants from Venetian times. After the bike tour the boat takes off to Kea. The starting point for the tour of Kea, the most westerly inhabited Cyclade Island, is the wonderful natural harbor of Korissia. From here we begin our cycle tour to the picturesque main town of Loulis, which is situated in the mountains and from there we continue our bike tour to the white beach of Otzias, where the Mediterranean will tempt you to a refreshing swim before we return to Korissia. 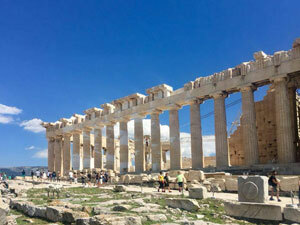 In the afternoon last sail to Piraeus and overnight stay in Piraeus. 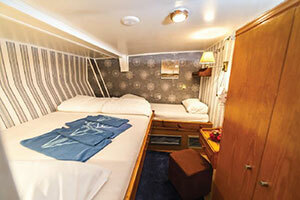 You disembark after breakfast on board followed by individual departure or you may extend your stay in Athens. 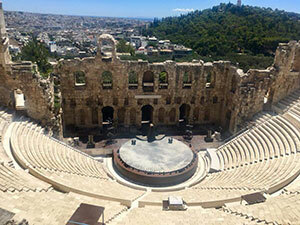 Two days exploring Athens and all her history! Looking forward to Cruising and Biking with you! Background photo credit: April M.